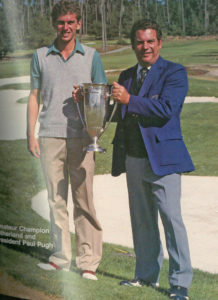 Paul Pugh, who served as NCGA President in 1986, died on April 8, 2019 due to cancer. Mr. Pugh was born and raised in San Jose; a graduate of Willow Glen High School and San Jose State. He became a CPA and joined a firm with Jim Petrinovich in 1970 which flourishes today (Petrinovich, Pugh & Company). As part of the proceedings the NCGA gave each player a packet of poppy seeds with the suggestion that, should their ball land in the rough, “Please scatter your seeds.” A day later, the course opened for public play. In retirement, golf remained a passion rivaled only by his love of model trains with a garden railroad that boasted over 1000 feet of track. Mr. Pugh leaves behind his High School Sweetheart and Wife of 55 years, Nancy. Father of Penny Fraley and Husband Steve, Steve Pugh, and Brian Pugh and Wife Tara. Loving Grandfather to Taylor, Conor, Griffin, Brendan and Emily. Beloved Brother to Joyce Ehrhart and Husband Richard of Chico CA. In lieu of flowers, the family requests donations be made in Paul’s name to The American Cancer Society via Relayforlife.org/odyseaaz (Team Pepe Le Pugh- in Paul’s honor) Services will be private.